This windswept view of lake, mountain and clouds is characteristic of Howey’s subject matter, whether he was working in pastel, watercolour, oils, or producing a linocut. He seems to have had a facility with watercolour, in particular, which had in his hands a natural affinity with the local scenes he depicted. He was a master of clouds and trees caught in motion by the wind, and of light skimming the surface of water. His watercolours share with his linocuts a hint of the Japanese – whether in the brushwork of the former or the composition of the latter. Robert Leslie Howey was born in 1900 in Hartlepool. He was the son of the Staithes Group artist, John William Howey (1873 – 1938), who – although recognized by his peers as a serious artist – never practiced his art professionally, but remained employed by the gas and water board.__His son, Robert, seems to have had similar equivocations about a career in painting (although when young he cleaned his father’s brushes and befriended other Staithes artists – Rowland Hill and Mark Senior): he did not enter the West Hartlepool School of Art until he was in his thirties. He appears to have started his artistic life by drawing and sketching, visiting local beauty spots such as Runswick Bay and Whitby; however, he also began to experiment with woodcuts and – particularly – linocuts. These were extremely fashionable in 1930s Britain; the simplified shapes and flat areas of colour, combined with a capacity to depict swirling, vortical movement, seemed to exemplify the visual concerns of the period. Artists such as Sybil Andrews, Cyril Power, and other members of the Grosvenor School were, and are, greatly in demand. Robert Leslie Howey’s linocuts do not share in the latter’s predilection for exaggerated viewpoints and centrifugal motion; they are landscapes as tranquil as his later pastels and watercolours. They are, however, expertly composed and supremely decorative, with a hint of the Japanese print. They were exhibited at the Leipzig Fair, the centre of the linocut and woodcut world, where he won great acclaim. His interest in linocuts only lasted during the decade of the ’30s, however, and after the war he switched to pastels, then to watercolour, and finally to a mixture of the two, for which he is, perhaps, best known. From the late 1960s he also produced oil paintings, similar in style and technique to those of his father. 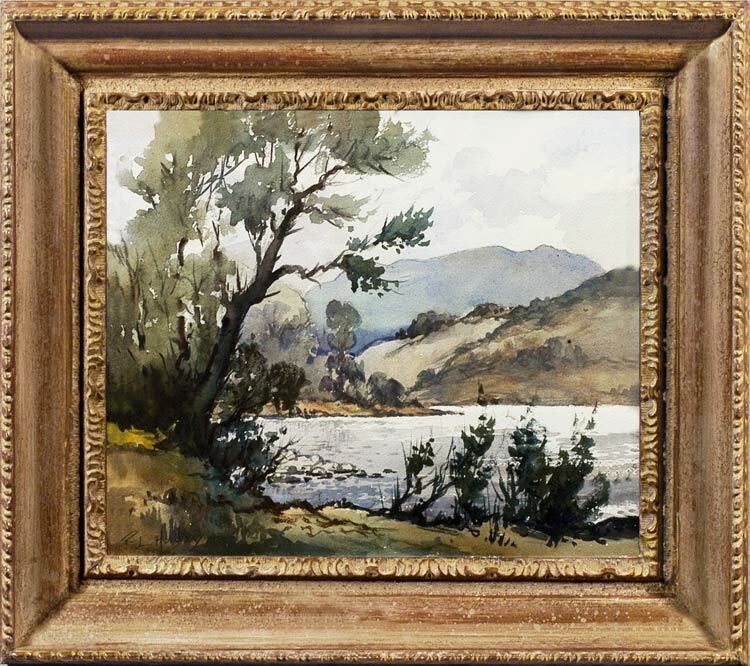 Howey exhibited at the Royal Scottish Academy, the Laing Gallery, Newcastle, the Redfern Gallery, London, and other provincial galleries; he also had a solo show in Hartlepool in 1949.